Aside from the alleged traitorousness, arrogance, callousness, short-sightedness, and all the other negative adjectives that have been largely forgotten or forgiven with LeBron James's recent success, the lasting aspect of The Decision will be a particularly clunky bit of phraseology that has nonetheless caught on: "taking my talents to South Beach." At first, the phrase was roundly mocked. It does sound rather awkward, after all. Immediately after LeBron announced his move, the internet turned "taking my talents to South Beach" into an amorphous catch-all euphemism for all sorts of sordid behavior. Various Urban Dictionary definitions seem to coalesce around the masturbation- and poop-themed usages—a sort "mowing the lawn" for the sports fan set. But at some point, probably right around the time LeBron stepped on the Celtics' throat in his first widely-heralded display of Jordan-esque killer instinct that lazy sportswriters were so adamant he lacked, the phrase began to lose its stigma. Today, you are much more likely to hear someone "taking their talents" somewhere in complete earnestness on ESPN's coverage of signing day than as a dorm room joke. Those most responsible for turning the phrase's meaning into something positive have been high school athletes. In a way, The Decision and the all-encompassing courting process it consummated were really a substitute for the college recruitment trail that LeBron never got to walk. So it's not all that surprising that the language associated with the biggest commitment announcement of all time has become the boilerplate verbiage for all those that followed. Gerald Willis III telling the world (and his bemused, LSU-fan mother), "I will take my talent to Gainesville, Florida." It hasn't only been the athletes, though. Newsmen have adopted the phrase too, though mostly in jest. The Miami Herald had some fun with the phrase when it announced "Hundreds of bikers take their talents to South Beach" during a bike-club meeting last year. In a bit of a stretch, a North Carolina television station claimed "Businesses take their talents to Super Bowl" when a local limo company was enlisted to help with transportation to and from the Meadowlands last week. One radio station had a whole "Taking My Talents To...." page on its website that hosted videos of high school athletes' college commitments. So the phrase started out being ridiculed, became a joke, and is now is an accepted, stigma-free way of announcing a big move. 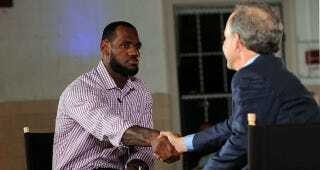 Who would have guessed that during The Decision, LeBron was lending his talents to the English lexicon too?